Congratulations to NAPT's Peter Mannella! NAPT Board Secretary / Region 1 Director Peter Mannella (NY) is the Empire State Society of Association Executive’s (ESSAE) Distinguished Member of the Year. In recognition of his decades of commitment to the New York Association for Pupil Transportation (NYAPT), Peter will receive this prestigious award in February in Albany, NY. Congratulations, Peter! Student transportation departments are consistently tasked with increasing efficiency and reducing expenses while maintaining service. Join your colleagues Wednesday, January 27 for Tackling Bus Stop Elimination. Register today! Over the summer of 2015 Chicago Public Schools attempted to tackle a very difficult cost savings initiative. This initiative included cutting more than 60% of the district's bus stops and required input from multiple city agencies. Changes ultimately affected 7,000 of the 90,000 students in the district's magnet and selective enrollment programs. In this webinar we will outline the entire process, from inception to completion, and also explain the lessons learned from a project this size. Take advantage of the opportunity to participate in the 2016 School Bus eXchange (SBX). Applications for Public and Private Operators are still being accepted! With more than 20 industry suppliers already committed to participating, you'll have the opportunity to discuss the latest products and services while developing unique relationships that will last far beyond SBX — all in an intimate setting. Hear what 2015 participants had to say about their SBX experience. There are a limited number of full scholarships available — apply today. The full scholarship includes all program content and materials, airfare and ground transportation to and from the event, two-night's stay at the Omni Interlocken Hotel, and all meals associated with the event. Learn more and complete a scholarship application at www.sbxconnect.com. The STS Media Team has given the School Training Solutions website a facelift. After many reliable years of delivering the online training, infographics, blog posts, articles, and activities in their older format, the website is seeing the improvements it deserves. With an eye toward a better mobile experience, SchoolTrainingSolutions.com is now responsive to different screen sizes. They've added search features to the blog, updated the resources and purchase sections, and improved site navigation. NAPT is pleased to have partnered with School Training Solutions™ to bring our Professional Development Series (PDS) directly to you, in an easy, convenient, and effective manner. To learn more about online PDS courses, visit our website. On Friday, December 18, Congress passed an omnibus spending bill to fund the government through the end of the Fiscal Year 2016. Of particular interest in the omnibus is $50 million allocated to fund the Diesel Emissions Reduction Act (DERA) program, plus an additional $20 million for "targeted airshed" grants for areas of high nonattainment aimed at Southern California for additional DERA-type funding including diesel retrofits, for a total of $70 million. A large tax package to renew a set of expired tax breaks was signed by the President on December 18, 2015. Included in the package was the extension of bonus depreciation and the alternative fuel vehicle tax credit. The package continues 50% bonus depreciation for 2015, 2016 and 2017 and phases it down to 40% in 2018 and 30% in 2019. The alternative fuel vehicle tax credit is extended for 2015 and 2016. This bill is a big victory for the eventual consideration of comprehensive tax reform which is likely to occur in 2017. Because this tax extender bill made many provisions permanent and also phases out others, it will improve the scoring for a future comprehensive reform bill by resolving many expensive tax provisions before tax reform. About two dozen tax breaks were made permanent by this bill. Let NAPT help you stay in touch with colleagues and up-to-date on industry news and interesting stories from around the nation. Federal education funding: Where does the money go? Two-thirds of Detroit schools close due to teacher 'sick-out'; could strike be near? 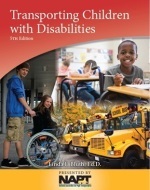 Transporting Children with Disabilities, 5th Edition, by Dr. Linda F. Bluth, is available for purchase. NAPT members may purchase the Handbook for $19.99, plus shipping. The nonmember rate is $29.99, plus shipping. To order your copy, please email NAPT Member Services Specialist, Brianne Peck at Brianne.Peck@napt.org today! To learn more about the new Certification in Special Needs Transportation (CSNT) click here. Transporting Children with Disabilities, 5th Edition contains new and updated information, including useful definitions of transportation and related special education terms as well as characteristics of children with special needs and special considerations for transporting children with special needs. This popular publication also explains the legal basis for special needs transportation in accordance with the requirements of the Individuals with Disabilities Education Act 2004, Section 504 of the Rehabilitation Act, and the Americans with Disabilities Act Amendments Act of 2008 and contains information about new Family Educational Rights and Privacy Act regulations. Safety Starts with MICHELIN® Tires. A No Compromise Solution of Longevity, Fuel Efficiency And Safety. Visit a Local Dealer to See Why.